Oasis are one of the first bands I really got into and they still hold a special place in my heart many years later, so a documentary focusing on their formation and first couple of albums was always likely to pique my interest. 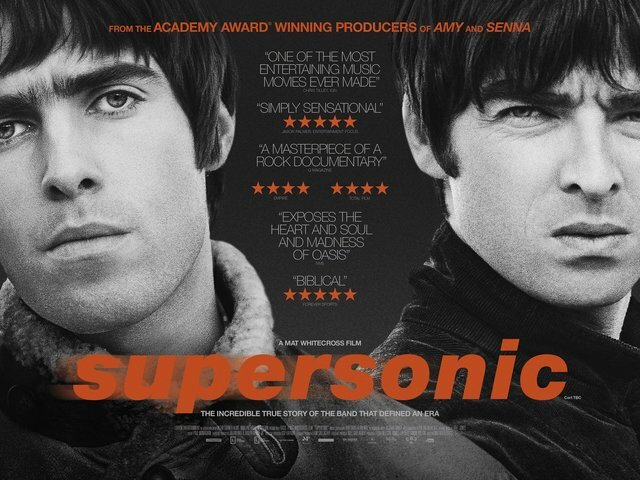 And ‘Supersonic’ is a very good documentary, focusing on the period in time when Oasis arguably were the biggest band in the world (certainly the UK), when their creative powers were at their peak and when they were at their most destructive. The documentary begins at their headline shows at Knebworth before circling back to the early days and it’s really insightful, even for someone like myself who thought I knew a lot about the band. One of the things director Mat Whitecross gets right is that he allows the music to do the talking, both in terms of featuring many of their hits heavily over the course of the film, but also in spending a lot of time on the songwriting process. It’s particularly insightful discovering more about how some of these anthems were constructed and came together and Whitecross (alongside the narration) ties Noel’s personal experiences at each point in time to the songs that he ended up writing. It helps that Noel is a witty and entertaining conversationalist, and his contributions really spark the events to life. The format of the documentary primarily uses a series of archive tapes of the band recording and concert footage to tell its story, with the band members and crew filling in the gaps with a voiceover narration, and it works particularly well. I’ve touched on Noel, but Liam is also great value here and a lot funnier than I remembered him, with both brothers coming across a lot better than I expected them too, focusing more on the music and the memories than their frayed relationship nowadays. There’s some really great anecdotes here, which I won’t spoil for those planning on seeing the film, but one in particular about a show in LA had me absolutely cracking up. ‘Supersonic’ is nostalgic in the best ways, returning to a band and a time that was a key part of my life and for many others, and I was laughing and smiling throughout.